Worth the purchase. 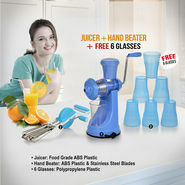 no more spending money on juices outside when you have easy of consuming healthy and fresh juices at home. Loved this product.. no more worries of going outside or buying expensive juicer machines. Good pick!